In America, the criminal justice system holds almost 2.3 million people in jails, prisons, and juvenile correctional facilities—a system that disproportionately harms African Americans. Due to racism, poverty, and social inequities, African Americans are five times more likely to be incarcerated than whites. Designing Justice + Designing Spaces (DJ+DS), an Oakland-based nonprofit, is using innovative design and real estate development to address the root causes of mass incarceration and to transform communities. Restorative justice is a criminal justice model that rehabilitates offenders through reconciliation with their victims. Research shows that restorative justice builds empathy, can reduce violent offenses, and alleviates trauma experienced by survivors. With its nonprofit, government, and community partners, DJ+DS designs peacemaking centers, mobile villages, and transitional housing to strengthen the restorative justice model and to promote educational and workforce development programs that reduce incarceration in communities of color. One of DJ+DS’s greatest achievements is Restore Oakland. An initiative in East Oakland with the Ella Baker Center for Human Rights and Restaurant Opportunities Centers United, Restore Oakland will be the first restorative justice and restorative economics center in the country. Expected to open in March 2019, it will include a restaurant and a job-training center for under-resourced people of color to secure food industry jobs and to avoid re-entering the criminal justice system or entering it in the first place. DJ+DS is also changing the way people and communities think about architecture and design. For example, in collaboration with San Francisco’s Women’s County Jail, DJ+DS developed a prototype of a mobile women’s shelter. 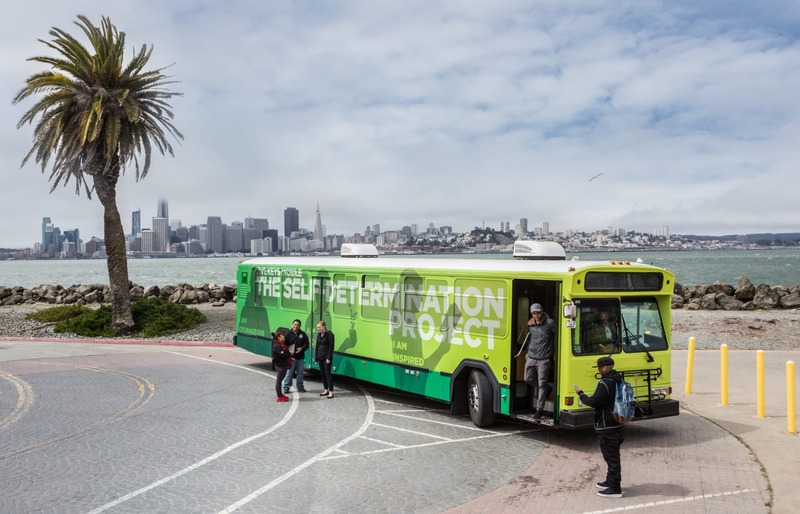 Utilizing donated city buses, the Women’s Resource Bus will provide a safe space for women after they are released from jail, often in the middle of the night—a critical moment to provide supportive services to reduce recidivism. The organization deeply engages community members in its design process. For instance, DJ+DS facilitated a five-day workshop with 60 women at a jail in San Francisco to develop the resource bus design. To enable this collaboration, the organization developed a design tool for working with people who are incarcerated. Surdna’s partnership with DJ+DS has been mutually beneficial—enabling DJ+DS to tackle systemic challenges facing communities and furthering Surdna’s efforts to build field capacity, spark innovative ideas, and connect stakeholders. Together, we envision a world without prisons—not more attractive ones—a world where our built environment counteracts the root causes of mass incarceration and fosters rehabilitation instead of recidivism.